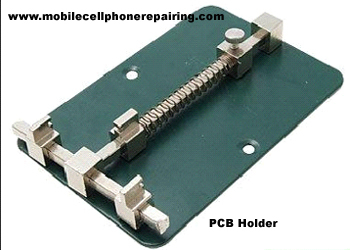 What is a PCB Holder or PCB Stand for Mobile Cell Phone Repairing? A PCB Holder or a PCB Stand is a tool to firmly hold the Printed Circuit Board of a mobile phone while soldering or repairing. It holds the PCB very strongly and doesn’t allow it to move thus helping in repairing. These PCB holders are made up of metal and are available in different size, weight and colour. These tools are also available in magnetic material. All of them are fully adjustable to hold a PCB of any size. Some of them are designed in a way so that they can be used under an under board heater or per-heater. It must be easily adjustable to hold any size of mobile phone PCB. It must be able to stop or fix it to the workbench or table so that it does not move while desoldering or removable IC and BGA. It must have option to be grounded to prevent static charge that can damage some sensitive electronic components. An ESD-Safe PCB Holder is the best.